i just love the name "witches brew". it is so festive & is the perfect name for a halloween punch! witches brew usually consist of a mixture of liquor and fruit juice, but if you want to make it kid friendly just leave out the rum. it is simple to make if you are hosting a party or need something to bring to a friends halloween party. i kept this brew on the healthy side of things to offset all the chocolate that will be coming our way in the next week. i stuck to a mixture of 100% pure juices & added a touch of sweetness with zevia's zero calorie cream soda. it is made with stevia, a natural sweetener & adds an unexpected punch of cream soda flavour to the mix. to make this that much more halloween-ish, i served it in a black bottom glass & garnished it with a fresh sprig of rosemary. if you want to serve it in a punch bowl at a party that works too! one idea would be to add little edible eye balls and spiders to the mix. p.s. HAPPY HALLOWEEN! we are going to the pumpkin patch, carving pumpkins & watching scary movies all weekend long. i LOVE this time of year! p.p.s. don't forget to whip up some festive cupcakes too. find my mummy chocolate cupcakes here, monster pumpkin matcha cupcakes here & my orange + black twisted cupcakes here. in a large pitcher add the rum, orange juice, pineapple juice, cranberry juice and cream soda. stir until well combined. 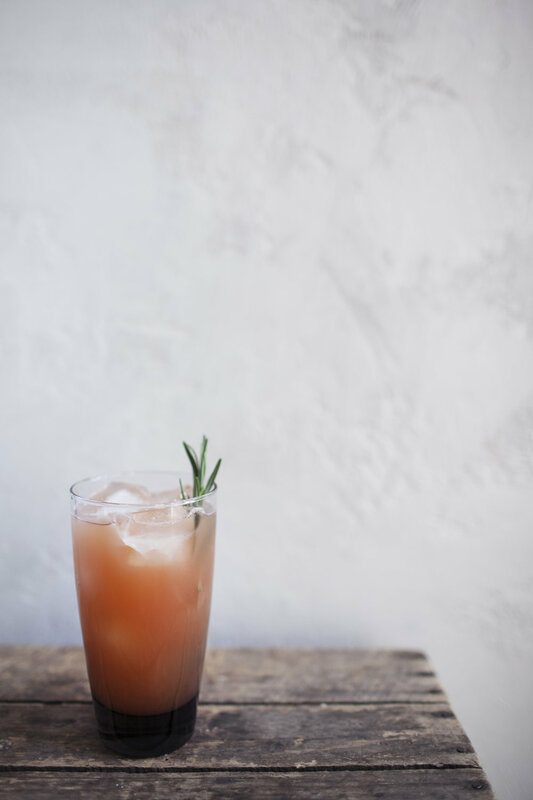 serve over ice and garnish with a sprig of fresh rosemary! this post was created in partnership with zevia!